Her parents expected she would become a doctor, but Alexa instead majored in marketing. And with the dawn of the internet, she discovered a passion for technology. 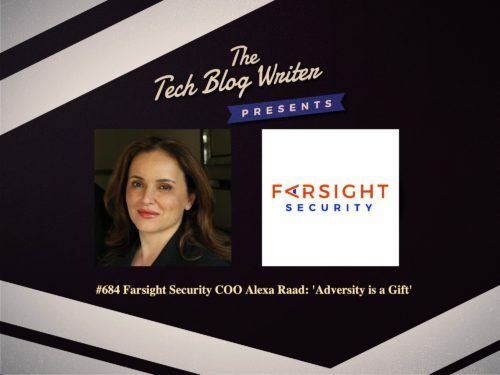 She has held senior leadership positions with AT&T, Bell Atlantic, and Cybercash and now serves as the COO of Farsight Security. Alexa Raad has deep knowledge in the cybersecurity, DNS and internet infrastructure industries and is the author of a US and European patent in internet security. In addition, Ms. Raad is a 20-year tech industry veteran, P&L leader and strategic advisor to CEOs, executive teams and private equity teams. She also has a successful track record of growing revenues, globally scaling organizations, and developing new markets in US, Europe, Latin America, and Asia. Her career experience includes roles as CEO, COO, Board Member, Chairman of the Board and private equity consultant. On my daily tech podcast, Alexa shares her journey to the C-Suite, the key threats plaguing the security operations center (SOC) and why internet governance cannot be our only shield against bad actors. Alexa also shares her inspiring story and explains why ‘adversity is a gift’ in this engaging interview.